Identification: Wings are translucent, wing fringes are often checkered. Upperside is gray-brown with faint or absent eyespots. Underside of hindwing is mottled black and gray; median band is lacking or faint with white outlines. Life History: To find females, males perch and patrol rocky areas during the day. 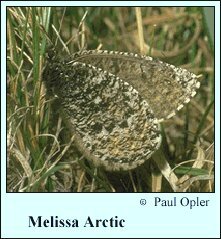 Females lay eggs on sedges or in litter around them. Caterpillars feed at night and pupate under mosses and rocks. Two years are required to complete development; the first winter is passed by first-stage caterpillars, the second winter by mature caterpillars. Flight: One brood from mid-June to early August. Caterpillar Hosts: Sedges including Carex bigelowii and C. rupestris. Habitat: Tundra, talus slopes, rocky summits and saddles, frost-heaved clear-cuts. Range: Holarctic. Siberia and the North American arctic from Alaska east to Baffin Island and Labrador. Isolated populations in the Rocky Mountains south to northern New Mexico and in the White Mountains of New Hampshire (O. m. semidea). Conservation: Necessary only for subspecies semidea. NCGR: Oeneis melissa semidea of New Hampshire has The Nature Conservancy Global Rank of G2 - Imperiled globally because of rarity (6 to 20 occurrences), or because of other factors demonstrably making it very vulnerable to extinction throughout its range. (Endangered throughout its range). Management Needs: Prevent development or trampling of habitat in New Hampshire.